Created and produced by puppet master Gordon Murray, "A Rubovian Legend" was a series of puppet plays that immersed children in a television fantasy world of kings and queens, castles, magic, and not to mention dragons and an organ pedal pumping cat! Drawing heavily on some of the more opulent fashions of the past, the stories might appear to be set several hundred years ago, while yet being curiously modern in some respects. Gordon Murray put this do. .fed hungry young minds with Presented by the BBC Puppet Theatre in the black and white television format of the time, initially the shows were presented live. With the advent of film recording (first with telerecording which recorded the video picture either during transmission, or instead of transmitting it, and then directly with a 16 mm camera in the studio), shows could be repeated, and as a result the majority of the 29-or-so episodes made were regularly transmitted from the mid-to-late 1950s, through the early 1960s. Perhaps more importantly, the film recordings allowed the plays to be seen by children in many British Commonwealth countries around the world, including New Zealand. King Rufus of Rubovia (R). The first three plays arrived on television screens in 1955, with The Queen's Dragon, Clocks and Blocks, and The Dragon's Hiccups. Initially lacking his own set of Rubovian puppets, Gordon Murray borrowed a set of marionettes from the BBC children’s puppet department. These 1/4 life-size marionettes, made by Kim Allen, were a lot smaller and less detailed than the specially created marionettes that Gordon used in the later episodes. After making the first three Rubovia plays using Kim Allen's puppets, Gordon Murray realized that in order to take Rubovia to a whole new level, major changes were required. During a two-year hiatus in production beginning around May 1956, he was assisted by fledging designer Andrew Brownfoot in a redesign, from scratch, of the whole Rubovian Legends idea. While Gordon was creating new scripts, and sculpting his own set of larger (1/3 life-size), much more caricatured marionette puppets, Andrew designed costumes and settings that were lavish beyond the imaginations of Rubovia's young audience. Both Gordon, and especially Andrew, were beginning to come into their artistic element, and the amazing thing was that the BBC was letting them do it, despite, as Gordon later put it, breaking "every rule the BBC has ever made." Andrew had some prior experience designing costumes and set for the BBC's children's puppet series, "Toy Town". Although Gordon was already by then a seasoned puppet maker and puppeteer, his new puppet designs represented a quantum jump in character and sophistication. It is interesting to compare the King of Rubovia and the Lord Chamberlain marionettes (pictured at right) with the set of identically sized marionettes that he created six or seven years earlier, for his 1949 production of Puccini's La Bohème (see below). Interestingly, and proof of Gordon's strong independence streak (something shared by most puppeteers), the new Rubovian Legend puppets remained his own property, to be rented back to the BBC for a nominal fee for each puppet performance. Once Gordon Murray had completed the new set of Rubovian marionettes, two of the earliest plays (Clocks and Blocks and The Dragon's Hiccups) were remade. Very few people remember the original plays, all three of which were transmitted live, without the benefit of film recording, and which only reached a handful of people in the BBC's London viewing area. 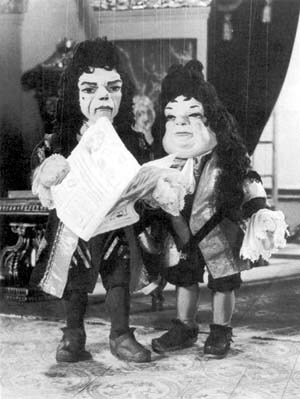 Consequently, the series is almost always identified with the new puppets, whose highly caricatured style, together with the lavish costumes and sets, together with repeat showings made possible by the miracle of film recording, left an indelible imprint on hundreds, if not thousands of young minds. All told, some twenty-seven puppet plays in "A Rubovian Legend" were made between 1955 and 1965. These plays reached a much larger audience due to the rapidly increasing number of television sets. 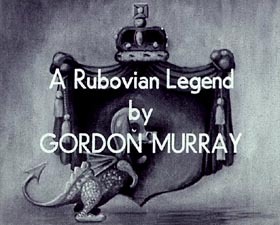 As part of his 1956 redesign of the "Rubovian Legend" settings, costumes, and puppets, Gordon Murray also made big changes to the puppeteer and voice actor lineup: Already established BBC puppeteers Molly Gibson and Elizabeth Thorndike, and also Joan Garrick, moved on to other BBC television projects, while BBC voice actors Peter Hawkins, Raymond Rollett, and Philip Latham went on to follow their own respective careers outside the BBC. Performers who carried over to the new were voice actor Violet Lamb (Queen Caroline of Rubovia), and puppeteers Audrey Atterbury, Bob Bura and John Hardwick. New to the revised voice line-up were Derek Nimmo (King Rufus of Rubovia), Roy Skelton (Lord Chamberlain), James Beattie (Sir Albert Weatherspoon), and Pamela Binns (the Grand Duchess Arabella of Humperstein). In a 1959 interview Gordon discussed just how serious he was in wanting to make children's television puppetry the best that it could be: "Before [Andrew and I] came [to the BBC], puppets were run by the typical Women's Institute type. I felt there was more effort needed. I hire a lot of actors to manipulate the puppets. It's quite important to use actors, you know, and strangely enough it's only the good actors who stick through the course they have to go through. The others who are only in the profession for the limelight soon pack up." The children's films that Gordon had in mind to make were not namby-pamby do-good tales of mediocrity, usually delivered by a narrator, but sought to create intelligent characters who had voices and opinions of their own, set with the traditional fairytale elements long enjoyed by children. The three earliest episodes ( the ones using the Kim Allen puppets) were performed live in front of the television camera. Unfortunately these broadcasts were not telerecorded, so no longer exist. (A space probe 40 light-years out, perhaps near Capella, Pollux, or Castor, might have the only chance of picking up the signal. ;-). Points of Interest: Visible in this photograph, which was taken in the BBC's "Tin Shed" at Lime Grove, are four BBC-TV cameras, seven crew, and two puppets on the centre stage. The photograph is not clear enough to determine if this is a scene from "Rubovia Legends", or one of Gordon Murray's other puppet plays. The puppeteers are out of sight above the stages on the puppeteer bridge. The 1959 date suggests that this play was actually Telerecorded onto 16 mm film, rather than sent out live. This photograph was published in the May 7, 1959 issue of The Stage and Television Today. Fortunately the later plays were Telerecorded onto 16 mm film, or (starting late 1959) just filmed using a 16 mm movie camera. Telerecording took a lot of the pressure off the puppeteers, allowed a little editing prior to being telecined for broadcast, and perhaps most importantly for us in TV viewer land, allowed numerous repeats. According to The Kaleidoscope Children's TV Guide, ten of these films still exist in the BBC's archives, and a further two are held by the National Film and Television Archive (UK) (see Chronology section). Other episodes may well exist in the hands of collectors. Rubovia's star-studded cast had Derek Nimmo with his unique plum-in-the-mouth voice in the role of King Rufus. Derek more than anyone else imbued Rubovia with an atmosphere that at once seemed just perfect for the king of an obscure European kingdom. Also perfectly cast into their voice roles were Roy Skelton (the Lord Chamberlain, Prince Rupert), James Beattie (Sir Albert Weatherspoon), and Violet Lamb (Queen Caroline). Derek Nimmo later became famous for his various clerical roles (which once led him to being arrested at the Vatican) and the radio word-play series "Just a Minute". Roy Skelton was later the voice of the Zippy and George glove puppets in Thames Television's "Rainbow" series, but perhaps became most famous as the voice of the Daleks in the BBC television series, "Doctor Who" ("Exterminate! Exterminate! ").